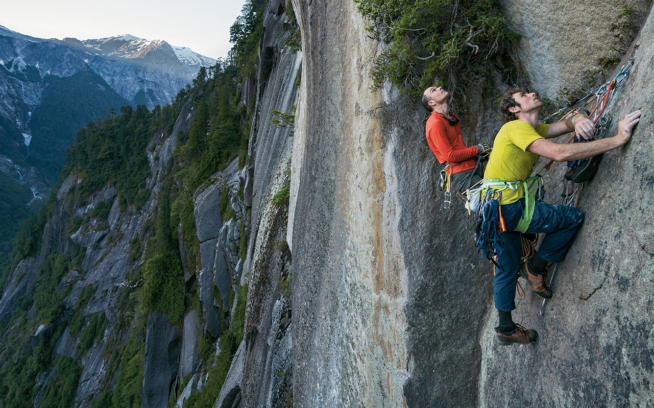 Fresh off her and Mikey Schaefer's new route on Guillaumet, Kate Rutherford writes again from Patagonia about her attempt on the Chouinard classic, the California Route. A few years ago, my infamous and extraordinary friend, Cedar Wright, told the world that Patagonia was "light" – as in weightless, fluffy, insubstantial, carefree. So I sit, rolling that word, like a little rock, around my mouth. He was referring to the Internet weather forecasting, the coffee, the beer, the pizza, the access to town, in contrast to the remoteness of the Karakorum or the era when Jim Donnini and Yvon Chouinard first came here. Yes, this place is light; it has paved roads and fancy hotels. But who is he to say that this makes the climbing in Patagonia light? And who am I, as a rock climber, to be writing about alpine climbing when I hardly know the difference between neve and alpine ice? When Mikey Schaefer, Dana Drumond and I climbed the California Route on Fitz Roy, and we turned our backs on the fog-obscured, wind-blasted summit, I did not feel light. So here is the question: When do you decide to go down? Is it after shivering for three days? Or because the cracks are full of ice? Because you don't really have any food? Is it when you don't know where to go, up or down, and you can't see the summit 80 meters away, and the wind is blowing really hard? Or is it when you get turned back? But who, or what, is it that turns you back? And what would a real alpinist have done? And is it "light"? Up on one elbow, I held a half-liter Nalgene and my rain jacket. I was trying to block the space between the sleeping bag and the ground, keep out the wind-driven snow and take my water rations all at the same time. I couldn't even drink the water. Three of us in one sleeping bag, trying not to let the wind in … light or not light? Day one had a 3am start from our snow cave at Paso Superior. The glacier hadn't even frozen all the way and clouds obscured the stars. We headed towards the California Route thinking "fun in the sun in Cali" sounded reasonable for these conditions, and it was too frosty to try anything else. La Brecha is the steep icy approach to many of the routes on Fitz Roy’s southern flank, and the six or so pitches went smooth. At the base, Dana Drummond led us over the bergshrund in a blazing pink haze. The sun came up just below the clouds and blasted us with a fiery fog before disappearing along its course into the castle of clouds. Dana led each ice pitch without any problem, the easy neve went fast and the couple of steep ice pitches were fun in the early morning. We were racing the clock as pitches melted and fell away behind us. La Silla, a graceful sweep of snow between Fitz Roy and the small peak on the southwest side of the col, marks the base of the California Route. We had a six-inch topo for 3,000 feet of climbing, and so we stared up at the maze of ledges and corners trying to find some resemblance between rock and map. It was my block, and I launched up a tiny pyramid of a pillar, stuffing my crampons in the off-width crack. The topo said go up and left, up and left. 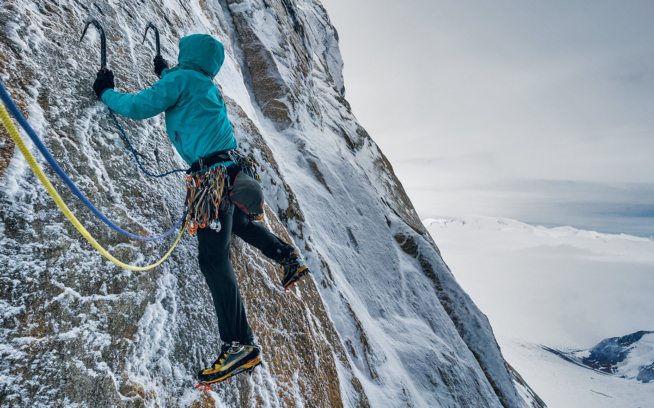 So I did, with my ice axes striking like wind chimes, I tip toed across an eight-inch ledge thinking I would be able to crimp or dry tool the top of the block that pressed against my chest. In the end, I just sketched my way along and finished with horrendous rope drag at a cold belay. Up and left we went, climbing in boots, French-freeing past perfect icy cracks way too cold to climb with rock shoes in the 20-degree weather. Eventually Mikey Schaefer took over leading and I stood shivering with Dana as Mikey headed up and up – a single pitch in the sun with a bothersome dyno, a traverse, a hand crack. We wound up to the west and found a small bivy at the base of a tall red dihedral, a spot that vaguely resembled the lines on the topo. Excavating and piling rocks, we barely created a bivy platform with enough room for two, not even close for three, but it would have to do. In the last light we watched the Torres as we melted water and devoured our modest dinners: an envelope of freeze-dried beef stew enriched with half a cup of instant potatoes. The thick stew went down too easy with one spoon between us – three bites pass, three bites pass, three bites pass. Afterwards, we pulled our one Feathered Friends sleeping bag over our shoulders. A custom-made zip-in wedge for the floor made it a miraculous, although tight fit, with everyone on their side facing the wall, shivering in unison like a happy little can of sardines. It was a long cold night. The second morning came cold and cloudy. We stayed on our ledge and cooked water 'til 10 am in a bed made from a pile of ropes and packs with one four-foot piece of insulated pad for our shoulders. We sat, cold, with our feet pointed towards the Torres and our backs against the mountain. A smooth layer of frosting-like clouds piled up against Cerro Torre, and we were overwhelmed in thinking they were coming towards us, but the beauty made that prospect tolerable. The topo seemed to say traverse left, which in our case was towards the wind, and so we went. As soon as Dana and I followed Mikey around that corner the wind was a constant blast. We hid, belaying behind a flake, as Mikey lead an aid pitch. Aiders swirling, clipping pitons that could have been from the Chouinard party’s first ascent luckily held, and the rope kept going up. I took Dana's crampons off his feet while he belayed in the little alcove. We had only one set of ascenders to share and so the four aid pitches were slow going. We followed ramps and cracks back up and right, unfortunately finding ourselves high in the big dihedral that we had slept under. At the end of his block, Mikey defied gravity while leading a steep, fully-iced 4.5-inch crack. Thrutching and swearing in every article of clothing he had, wearing boots and a full camera bag, Mikey aided, free climbed, and off-widthed. He chipped ice, chimneyed and finally swung an ice tool into the crack, mantling it to reach a hand jam. From there, Dana scampered up a wide hand crack (gloves make everything feel like a hand crack) and found a pleasant belay in the evening sun. Thrilled by the sun's warmth we leaned over the edge of the ridge that falls away into the depths of the Super Canaleta. From here we could see Fitz Roy’s summit. Below, clouds swirled in the Torre valley, and we made our way along the ice-rimed ridge. Huge roofs with four-foot fangs of ice loomed above Dana as he traversed. About to lower off a piton left by our friend Colin Haley, he thought better, and gave it a test tug. It came right out, we laughed, a touch disturbed, and Dana slung a block to lower from. A wild, knife-edge ridge traverse led us to a rappel where we threaded through a little tunnel that joined the base of the snow and lead to the top. Darkness caught us looking for a bivy on the snowy ridge. Weaving between boulders, the snow conditions were variable – the steep east side of the ridge offered nothing flat for sleeping. The summit boulder-field loomed close and was plastered with ice when we reached the flat top of the snow ramp. It was calm and clear as we chopped an easy bivy platform for three, building walls of rime mushrooms and rocks to hide from the possible wind. We melted water 'til 1am, and snuggled in after eating the last half of a baguette, cheese and salami saved from our lunch for the day – we hadn't planned on a second bivy or second dinner. Dana shivered between Mikey and I, his Christmas sweater hadn't proven to be quite enough insulation. And when the wind came at 4am, we just shivered harder. I'd been sleeping on my rain jacket, but instead used it like an umbrella to cover my head, eventually sharing it with Dana. We all decided to roll over and see if the freight train might pass. An hour later, the wind was howling still, and the snow was starting to collect inside the sleeping bag. I peeked out from under my umbrella and the summit was gone. I could only see 20 feet in front of me. I finished one of my two energy bars and, desperately thirsty, dredged up the mini Nalgene from between our feet, stored there to keep it from freezing. It wasn’t really a question when I mentioned the summit – and there was no response. 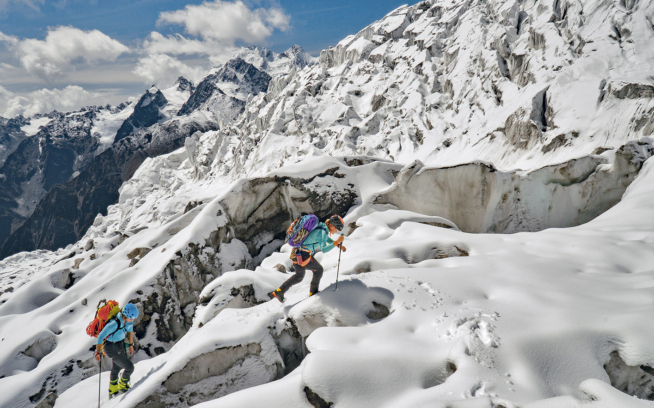 Our exit strategy: shove feet into icy boots, pack sleeping bag, put on harnesses, coil ropes, go down. No time for water, no time for photos, NO time for the summit, only time to go. We had no idea where the raps were. As Mikey rapped into the fog I echoed our friend Camilo's words, "There is a huge block, it is the only one, it's at the top of the Franco Argentine route. You can't miss it. The raps start there." There were blocks everywhere, huge ones in fact. In the fog they all looked the same, and south seemed just as likely as east. Luckily, on the second rap we found anchors and sailed with the wind down six or seven pitches, coiling ropes into packs and chopping anchors out of the ice. All of a sudden though, we were on a big ice field and there was nothing. I stood at the anchor shivering, staring at my boots, wondering how to make my toes warmer, when I heard a curse. As I turned, I saw the fog part and Cerro Poincenot glowed for just a second in golden sun. Then it was gone. F***! We were way too far west! Up and over a small pillar, we traversed east. Dana built an anchor, and then Mikey thankfully found another, 10 feet around the corner. It seemed we were back on route. Down and down. I ate my 700th calorie for the day. Yes, I was counting. My stomach hurt, I was hungry and shivering. For us, the raps ended with a dizzying 60-meter rappel off the end of the ropes into the fog. I was the last one down and I worried watching the rope ends flutter in the wind. I couldn't see the boys. Finally they appeared to the right, I sighed, still 50 feet off the saddle of La Silla. The traverse back to La Brecha started with nasty ice in dull crampons and ended with wind toppling us over and blasting us in the eyes. We all exhaled as we reached the top of La Brecha. Suddenly, everything was very tranquilo and after three days we weren't on-sighting any more. Talk about "the snow cave of luxury" started, laughter came more easily and on the last rappel over the bergshrund we smiled when the old, core-shot fixed lines buried in the ice still held. Just before dark, after 12 hours of rappelling, we crossed the glacier and, elated, returned to the snow cave to a feast of calories and emotions. So, Cedar, are you calling our three days of shivering light? Maybe it was, because in the end here I sit, eating cookies in town, feeling a little at a loss for the reason why we turned around. It was so obvious then, so cold, so much suffering already, every moment I wondered why we continued up. Yet, what was a little more suffering? I knew I would feel disappointed, having climbed the mountain but not actually standing on the summit. It was so close. All this pondering happens back on the ground though, and it is what keeps me excited, heading out and up, again and again. There is no fog here in town, no wind, no uncertain descent, no mystery. The only thing that reminds me of why we didn’t go to the summit is a little numb spot on the end of my big toe. It was not so light. Kate and Mikey are still down in Patagonia. At last report, a weather window had appeared and they were off to try another objective.